Mondays. They're the worst. But yesterday, we started off our week with a surprise date night. Andrew picked me up from work & instead of fighting the traffic of rush hour, we decided to try out a restaurant that's been on our 'to try' list for a long time, Frank. Their claim to fame is hot dogs & cold beer, two of Andrew's favorites, so he knew he would love it. I had heard great things about their appetizers too, so I was game. The restaurant sits at 4th & Colorado, & on a Monday evening, we had no trouble finding a spot along the street to park. 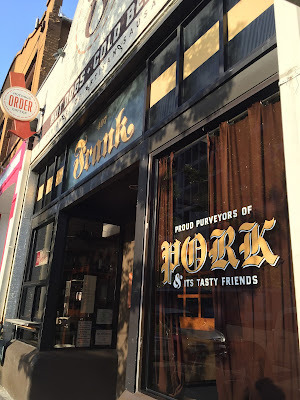 Full of cool murals, friendly, helpful staff & clever catch phrases, Frank is a fun place to be. We started out by ordering some drinks & queso fries. 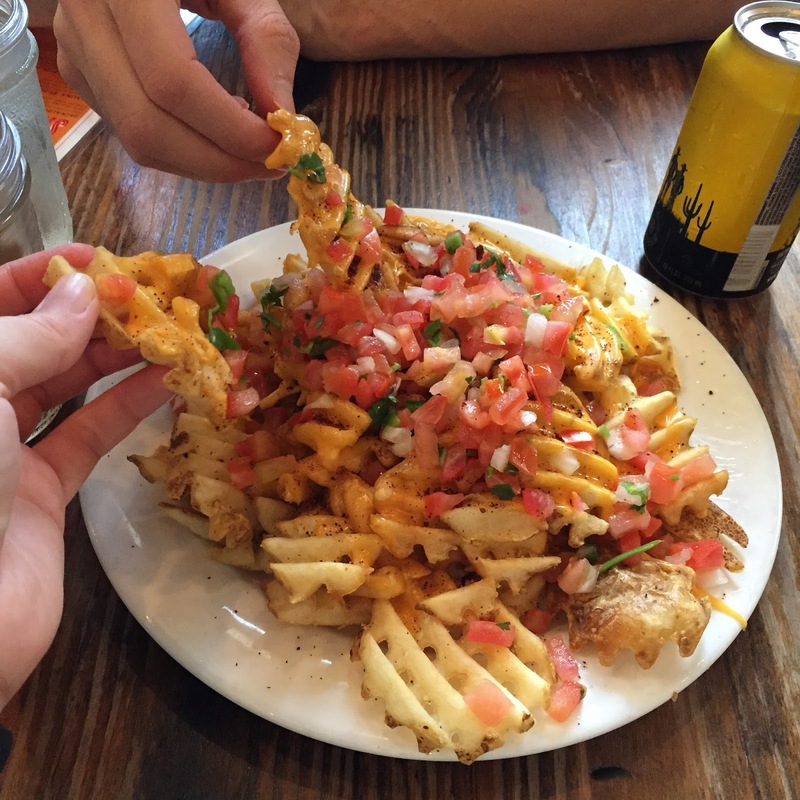 Because, the only thing better than queso, or waffle fries for that matter is the two put together. Frank has an impressive selection of drinks. Andrew ordered an Infamous Hijack Cream Ale & I tried Argus Ciderkin, both of which are made right here in our awesome city. The Ciderkin was sweet, tart & bubbly & complimented the dogs & fries really well. I'll definitely be finding out soon how I can get some bottles to have at home. Queso fries hit the spot, as we were starving when we arrived. We got their 'small' plate, which was more than enough for two people. The fries were crispy on the outside, soft on the inside, just as good fries should be & the queso was delicious, with just a hint of spice. 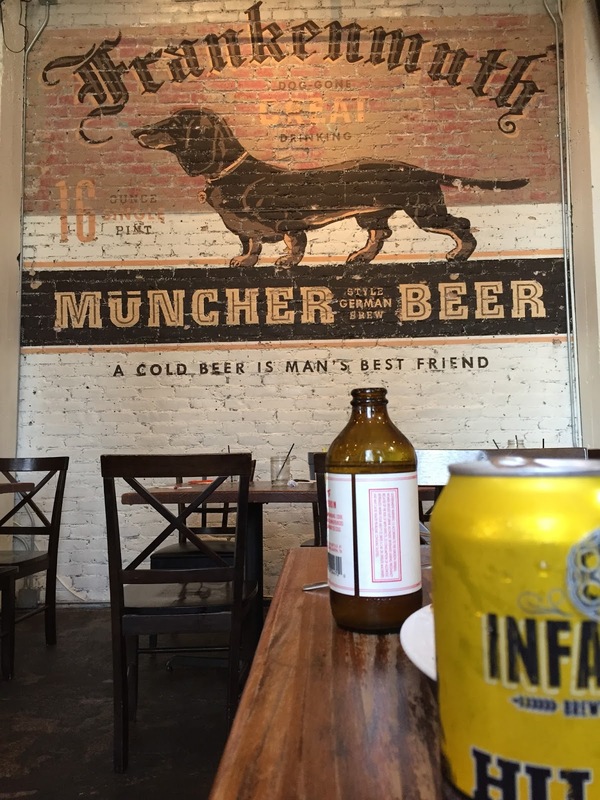 While we were munching on the fries & sipping our drinks, we contemplated which dogs to order. It was a tough choice, as there are several kinds of sausage & a long list of topping varieties to choose from. I went with a special, the Caprese Dog. Veggie sausage (it was Meatless Monday after all) topped with basil, mozzarella & tomatoes with a balsamic drizzle. It was really tasty & I was surprised by how much I enjoyed the veggie sausage. I didn't miss the meat! 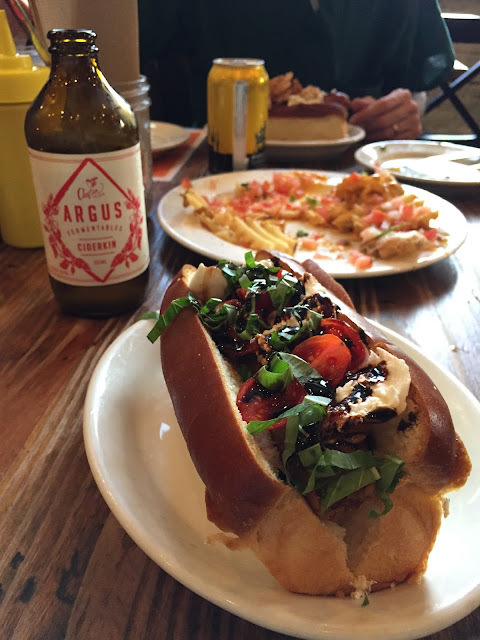 The fresh caprese paired with the crispy, slightly spicy veggie sausage & soft bun made for a delicious combination. Andrew went with a Fico Anatra. 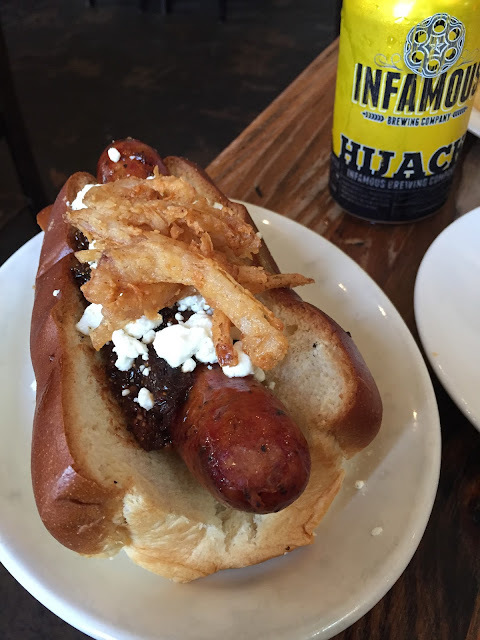 Duck & pork sausage with fried shallots, fig mostarda & Pure Luck chevre. Pure Luck chevre is one of my favorite local treats. I think you could top a tire with one of their cheeses & I'd try a bite. His dog was full of rich flavor. The duck/pork sausage had a good heat, which was evened out by sweet fruitiness of the mostrada & the creamy, crunchy punch of the onions & chevre brought everything together. Frank made our Monday night really shine & we will certainly be back. Next time I'd like to try the house-made corn dogs, Canadian Waffle Poutine, or the giant pretzel, made with Austin Beerworks Black Thunder. Yum.